The crew only have 2 states - Black for normal, and red for injured. Injured crew will perform their role at reduced capacity until healed using either the Large First Aid Kit or Small First Aid Kit. Injury to crew can be reduced by the Spall Liner equipment, Large First Aid Kit consumable, and Pain Tolerance skill. The use of the Toolbox equipment, Large Repair Kit consumable, and Repair skill will improve the repair time of damaged modules. Ammo Rack Damaging the ammo rack of the tank slows the tanks reload rate of ammunition by 50%. Players often refer to it as "ammo racking" a tank. Sometimes a hit to the ammo rack can destroy the ammo causing it to explode and destroy the tank entirely. You will know a tank has been ammo racked and destroyed as the ammo symbol will flash in white briefly at the moment of destruction. Damage to the Ammo Rack can be minimized through the use of the Wet Ammo Rack equipment or Safe Stowage perk. Engine Damaging the engine reduces the engine power by 50%. The tank will be slower to accelerate, traverse, and have a slower top speed. Rendering the engine inoperable effectively stops the tank from moving or traversing entirely until the crew repair the engine to a damaged state, or the player repairs the engine completely. A hit to the engine can also start a fire and the tank will continue to take damage until the fire is extinguished. The chance of fire can be minimized through the Preventative Maintenance perk. The speed of putting out a fire can be improved through Fire Fighting skill or Automatic Fire Extinguisher consumable. The front glacis is technically not a weak spot as such but more one of the spots that could be targeted by a player if facing an enemy tank head on, and is the preferred spot over main frontal armor which is generally thicker and or better angled. Fuel Tank A damaged fuel tank may catch fire causing damage to your tank every second until extinguished by your crew or extinguished by the player. Setting a tank on fire through a fuel tank or engine hit can cause significant damage if not extinguished quickly. The chance of fire from a fuel tank hit can be minimized through the use of the Fill Tanks with CO2 equipment and the Preventative Maintenance perk. If a fire has started the speed of putting out the fire can be improved by the Fire Fighting skill or Automatic Fire Extinguisher consumable. The player can also manually put out the fire with the Manual Fire Extinguisher consumable. Gun Barrel A tank is not tank without a gun! 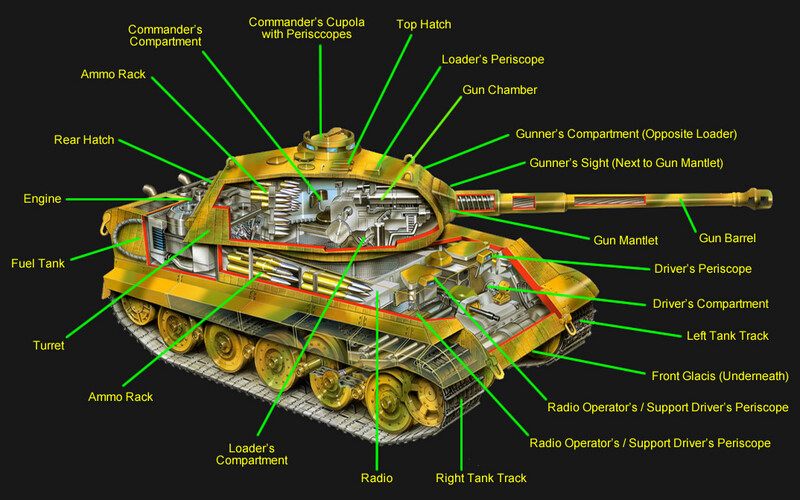 Damaging the gun, that is the Gun Chamber, Gun Mantlet, or Gun Barrel reduces gun and shot accuracy by 50%. A gun that is knocked out wont be able to fire at all nor vertically traverse until repaired. The effect of the accuracy penalty applied to a damaged gun can be minimized by 20% using the Armorer skill. Radio Damaging the radio of a tank impacts the capability of the tank to communicate with its team and hence reduces enemy spotting through reduced signal range. Knocking out the radio entirely significantly impacts on radio communication and tank spotting both of the player's tank and enemy tanks spotted by team mates. Tank Tracks Damaging a single track has little to no effect on the tank however damaging both tracks affects a tanks traverse speed. The bigger impact is knocking out a tank track, that is the actual track breaks / unlinks rendering the tank completely immobile until repaired. Often referred by players a "tracking a tank" an immobilised tank is a sitting duck especially if immobilised in an open area where its very susceptible to artillery fire. The chance of having your tank "tracked" can be reduced through the Enhanced Suspension equipment. The Track Mechanic perk can improve track repair time. Turret Damaging a turret reduces turret traverse by 50% and knocking out a turret immobilizes the turret in its last position until repaired. Its worth noting that the turret contains a number of modules and crew within it and hence is a valuable target. Its also worth noting that on many tanks the turret armor is thicker than the hull armor especially the front of the turret. Top Hatch Hatches are weak spots that if hit generally result in 100% shot damage to the tank. A hit on a hatch wont directly affect a module or crew member however its worth noting that hatches are situated on the turret and a turret penetrating shot may continue to travel and cause further damage to modules or crew members. Commander's Compartment This is where the boss sits. A hit to the commanders compartment can injure the Commander. An injured commander reduces the view range of the tank and removes the Mentor skill bonus until he is healed. Commander's Cupola with Periscopes Most tanks have a cupola, and some tanks e.g. Tortoise, have a large cupola. Tanks that are hiding behind terrain or a dead tank can be protecting the hull and part or most of the turret exposing only the cupola. Unless you are very close to the enemy tank hitting the cupola requires an accurate shot but can cause 100% damage if successful. A cupola hit can also injure the Commander, and damage / knockout optics which impacts spotting range. Optics that are knocked out reduces spotting range by 85% until repaired. The penalty applied to spotting range can be reduced by the Recon skill. Driver's Compartment A tank is going nowhere without a Driver and injuring him reduces the top speed, traverse speed, and acceleration of the tank until he is healed. Driver's Periscope Not all Drivers have a periscope and instead have a horizontal slit for the Driver to see. Periscopes are quite small and hard to hit however a periscope hit can cause 100% damage and potentially knock out Optics and injure the Driver. Optics that are damaged / knocked out impacts spotting range. Optics that are knocked out reduces spotting range by 85% until repaired. The penalty applied to spotting range can be reduced by the Recon skill. Gunner's Compartment The "Damage Dealer", injuring the Gunner reduces the aiming speed and shot accuracy. The Gunner also controls the turret traverse and injuring the Gunner reduces turret traverse speed. Gunner's Sight Not all tanks have a Gunners sight and can instead have a periscope. The Gunner's sight is found on the front of the turret and is smaller and harder to hit and penetrate than a periscope however a sight hit may injure the Gunner and/or damage the gun. A sight hit can cause 100% damage to the tank. Loader's Compartment Injuring the Loader decreases the reloading speed of ammo and has a similar effect to damaging the ammo rack. An injured Loader on tanks with large calibre guns really affects the reload rate which is already quite slow. Loader's Periscope Similar to the Driver's Periscope, the Loader's periscope is quite small and hard to hit but a hit can cause 100% shot damage, and damage / knockout optics. Optics that are damaged / knocked out impacts spotting range. Optics that are knocked out reduces spotting range by 85% until repaired. The penalty applied to spotting range can be reduced by the Recon skill. Radio Operator's Compartment Injuring the Radio Operator decreases the radio range and effectiveness of communicating with team mates, which in turn affects the capability to spot tanks directly or via team spotting. Radio Operator's Periscope Similar to the Driver's Periscope, the Radio Operator's periscope is quite small and hard to hit but a hit can cause 100% shot damage, and damage / knockout optics. Optics that are damaged / knocked out impacts spotting range. Optics that are knocked out reduces spotting range by 85% until repaired. The penalty applied to spotting range can be reduced by the Recon skill.